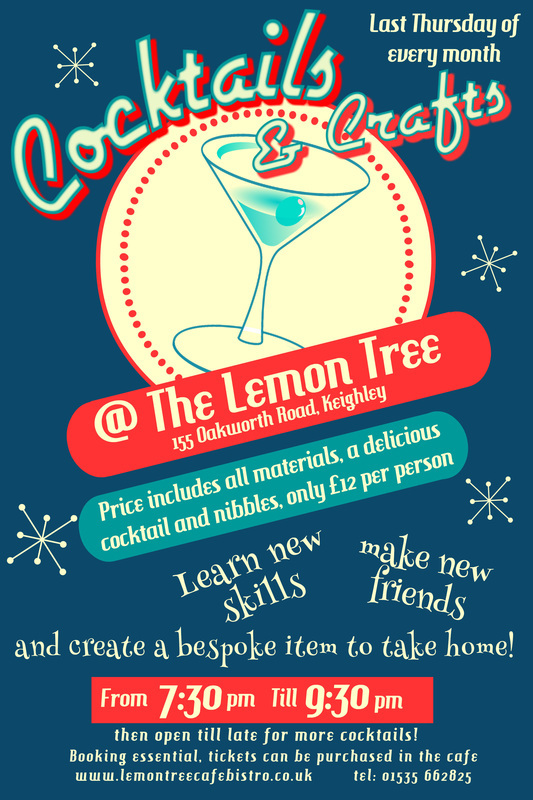 Launching on Thursday 30th October, Cocktails and Crafts @ The Lemon Tree Cafe Bistro will take place on the last Thursday of every month and promises to be a fabulous creative evening for newbies or experienced crafters. Come with friends or make new ones on the night! Booking if essential and tickets and more details are available in The Lemon Tree, Oakworth Road, Keighley. The activity for the first event will be Washi Tape projects. This will include making handmade notebooks, mirco bunting, greetings cards and washi tape letters. ​The event costs just £12 which includes all materials, your first cocktail and some delicious nibbles on the night. The evening starts at 7pm for cocktails and nibbles then crafting will take place from 7:30pm until about 9:30pm and the cafe bistro will stay open late for more cocktails! Please email info@lemontreecafebistro.co.uk or call 01535 662825 for more details.